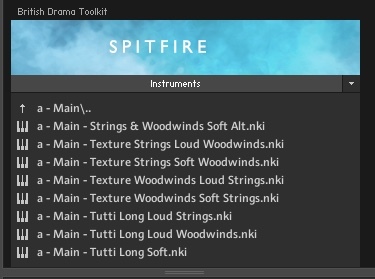 Spitfire Audio’s British Drama Toolkit – what is it? The British Drama Toolkit is a slight deviation from the libraries we’re used to seeing from Spitfire. It consists of a small string and woodwind section but the sounds are layered, with textures varying according to velocity. The instruments, all soloists, are Violin, Viola, Cello, Double Bass, Clarinet, Bass Clarinet, Flute and Piccolo. The library runs in Native Instrument’s Kontakt sample player version 5.6.8, both the free and paid-for versions, and it’s NKS-compatible for users of Native Instruments hardware. It’s a modest size for a Spitfire library, only 6.8Gb, although it requires twice that during installation which is via a download. It doesn’t take long, even with a relatively slow connection. 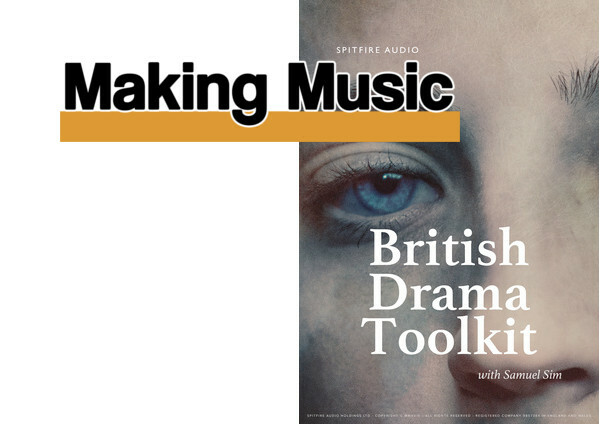 The British Drama Toolkit was created in collaboration with Samuel Sim, a British composer who has written scores for more TV series than most of us have had time to watch, along with several Hollywood blockbusters. The idea was to create an instrument that responds to emotional playing to create the emotional sound that Sims is renowned for and, as Sims says, to prevent you getting sucked into “the vortex of the computer”. The library title has obviously been taken from a particular type of TV program – and this is not the only type of music that Sim writes – so expect it to create moody, atmospheric, slowly evolving, intimate, emotionally charged compositions. Have I covered all the adjectives? As well as the individual solo instruments, there are also Main and Ensemble instruments. Main consists of the entire ensemble mapped across the full width of the keyboard. However, the crucial thing is, the samples are mapped to velocity. Each articulation has either two or three velocity layers. The two are Soft and Texture, while the three adds Loud. So, playing softly triggers the Texture layer, playing hard triggers the Loud layer and playing in-between triggers the Soft layer. 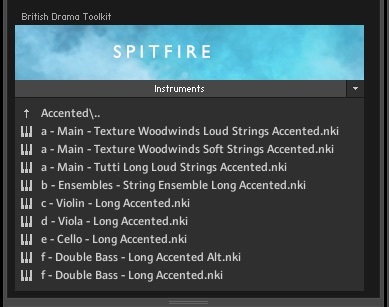 The interface is similar to Spitfire’s other Kontakt instruments with a General Overview and an Expert View, but the British Drama Toolkit also has a unique Velocity Layer View which is the default on loading. As usual, the articulations are along the bottom but the central area shows the two or three velocity bands. When you play a note, a bar appears in the display showing which velocity zone it falls into. There are eight articulations which we’ll look at in a second. They are combined in various ways to produce the, er, on-screen articulations. That sounds more complicated than it is but it’s just a matter of terminology. Rather than articulations, we can call these building blocks techniques. While we often use the two terms interchangeably, in the British Drama Toolkit it helps to think of them as techniques which are combined into the on-screen articulations. For example, the default articulation when you load the Main instrument is Tutti Long String Loud. (Usefully, with all Spitfire libraries when you select an articulation the name appears in the panel to the left.) That combines a Long articulation with a Loud Strings articulation. The manual helpfully lists all the combinations for all the instruments so you can look up combinations that interest you. We’ll briefly run through the eight articulations so you can get a flavour of how the sounds are constructed. The Texture layer is the bedrock of the library. The instrumentalists played softly and texturally (well they would, wouldn’t they?) so you can hold long notes and hear the variations in tone as the sound progresses. And the changes are very noticeable. They move and evolve and you can simply hold down a chord and let the texture create a background for you. This is the closest to a ‘normal’ long and can be played over a Texture or used to create a background itself. These notes have been played in a more solo or virtuoso way and are ideal for stand-out melody lines. These start out loudly but gradually decrease in volume to blend with the other layers. This is simply an alternative to the Long Loud articulation. These are specific to the strings. They use a technique which causes a string to resonate at a higher frequency producing a tone that can be ethereal or shrill. These are specific to the Flute and Piccolo and give the note a bright and sharp attach with interesting overtones. These are Clarinet techniques which create a chattering sound. You can see this is all about texture. There are no short staccato or spiccato notes or no epic brass. You’re in no doubt what this library is about. There are 11 on-screen articulations for the Main instrument which have been created to be a good starting point to illustrate what’s possible with the library. They include combinations such as Strings & Woodwinds Soft Alt, Texture Strings Loud Woodwinds, and Texture Woodwinds Soft Strings. You can see – and hear – the textural differences these produce. The other combination instrument is Ensembles with 15 articulations which are less string-based although there are a few string patches. They include several Bass Clarinet and Clarinet articulations, Flute and Piccolo, and Woodwind ensembles. The Main and Ensembles instruments might be where you’d start for inspiration. It’s wonderful to play a soft spread chord, for example, hear the textures changing, and then add a top line or even more textures over the top. The system works particularly well if you play chords which change just one note at a time. Even simply holding a chord can create inspirational textures. With the solo instruments, the number of articulations varies from three for the Clarinet to eight for the Double Bass. The number of layers also varies between two and three. You might think that you need the Main or Ensembles patch to produce a widely-textured sound but that’s not the case. The layers of the solo instruments have wonderful textures of their own and you could well create a cue simply from the Flute, Viola or even the Clarinet. The layers are triggered by velocity. It’s easy enough to play hard to hit the Loud layer and not too difficult to play softly (but still audibly) to play the Texture layer. However, it can be a little more difficult to hit the middle Soft layer. The velocity ranges are not adjustable and you need to look at the display to see how hard you’re playing. How easy you find it will depend on your keyboard as some are more responsive than others, but also on the way you play. The interface does have an adjustable velocity curve with four preset curves plus a customisable one where you can draw in your preferred shape. After much experimentation, I settled for the default linear curve although it may not be the best one for you. The library is designed to inspire composition as you play so not hitting the right velocity is unlikely to be a big deal. If you’re recording into a DAW you can easily edit the velocity. Just to complete the instrument round up, the Advanced folder contains two further folders – Accented and Individual articulations. Accented contains the accented articulations which start loud then reduces in volume to blend with the Soft and Texture layers. There are three Main Accented instruments featuring woodwinds and strings, and two Double Bass ones, essentially offering two variations. The Individual Articulations folder contains, as it says, the individual articulations, some of which are used in the Main and Ensembles instruments. Some, but not all. 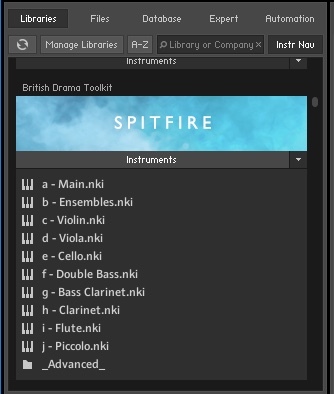 Spitfire’s aim in creating the British Drama Toolkit was to produce a series of multi-layered instruments whose textures can actually contribute to the composition process. The Main and Ensembles instruments are there just to get you started but the real fun lies creating your own combinations. It’s easy to combine individual articulations by loading several instruments into Kontakt and setting them to the same MIDI channel. For example, you could combine a Cello Long with a Viola Soft and Flute Chiffs. Add more if you wish. The string harmonics make an excellent top-end texture for a lower solo line of strings or woodwinds. There are many possible combinations producing slightly different textures and top lines. You can go further than playing individual articulations by selecting two or more articulations at the same time (Shift-click does it in the interface). As you might imagine, it’s like have six, eight or more layers playing together. The only caveat is not to get carried away and select too many as this can lead to the pipe organ effect. We’ve spent so long discussing the sounds that we’ve barely touched the interface. We’ve mentioned the General and Advanced Views. These work as they do in other Spitfire libraries with a few obvious differences to match the function of the library. There are only two Mics – Close and Tree – and two controllers – Expression and Reverb. It’s worth noting that the instruments were recorded at Spitfire’s custom-built dry stage and a dash of the reverb is switched on by default. Use this or a reverb of your choice in your DAW to blend it with other libraries. There are stereo width and pan controls, round robin settings and the usual Tweak controls. There is no Ostinatum as the notes are not short and it wouldn’t make much sense in the context of the library anyway. My only wish for the interface is that Spitfire would make it a bit larger. There’s lots of screen real-estate in Kontakt and some of the icons are difficult to see on a small screen or from a distance and for people with less than 20/20 vision. Spitfire produces absolutely excellent sample libraries and it’s great to see the company bring out something a little different – a library with instruments designed to be part of the composition process. 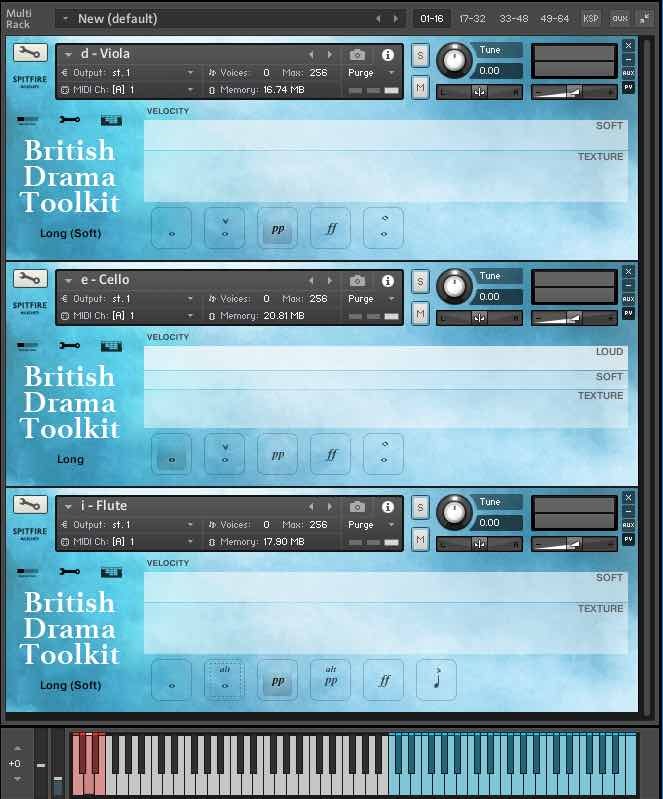 The blurb says the British Drama Toolkit allows you to compose, arrange and complete a cue in one pass. I won’t say that might be stretching it, depending on the length and type of cue as well as your compositional prowess, but playing it is certainly inspirational and for certain types of cue – hint: British Drama types – you could well sit down, watch the film and be inspired enough to write something very usable. Another use is to put the textures under a cue you’ve written using other libraries, perhaps more openly instrumental or orchestral. The mix works really well, not just with Spitfire libraries, and the evolving textures can add an almost-organic feel to a piece. 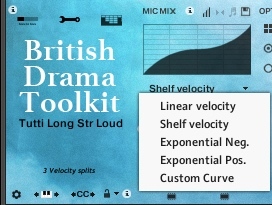 If you work with drama and especially if you work to tight schedules, the British Drama Toolkit is an absolute Must Have. If you don’t, it’s a great way to add texture to your compositions. And if you like sitting down and composing on the fly, then it should inspire you for a long, long time.